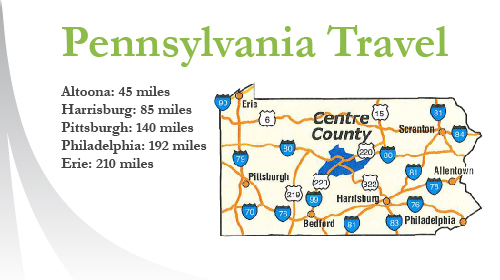 Centre County is a centrally located transportation hub for both Pennsylvania and the Mid-Atlantic region. 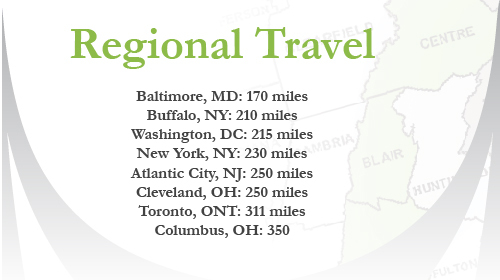 From a fly-easy airport to interstate highways, travel to and from Centre County is always convenient. For additional transportation information, contact Jennifer Myers, Vice President, Economic Development, at Jennifer@cbicc.org. 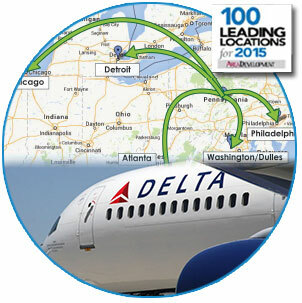 The University Park Airport (SCE, UNV for private flights) offers numerous daily flights to and from hubs in Chicago, Detroit, Philadelphia and Washington Dulles. Delta, United Airlines and America Airlines service the University Park Airport. 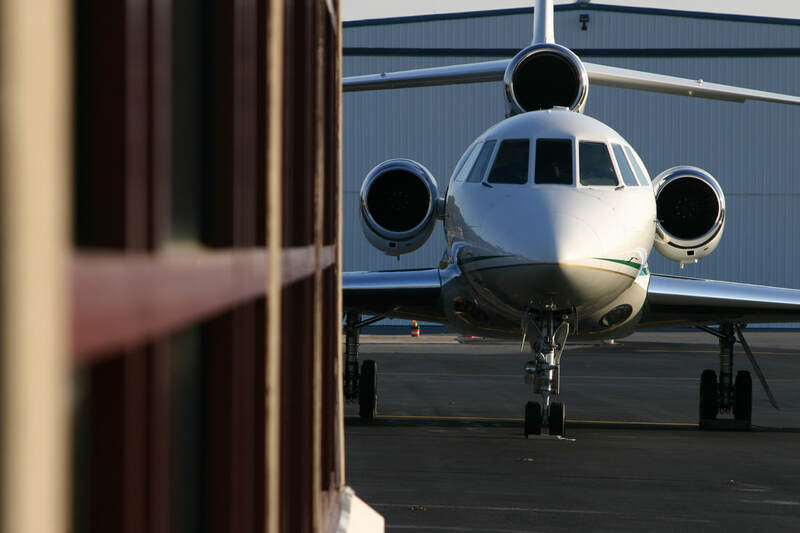 For more information about air service, call the University Park Airport at 814 237-2011 or visit www.universityparkairport.com. 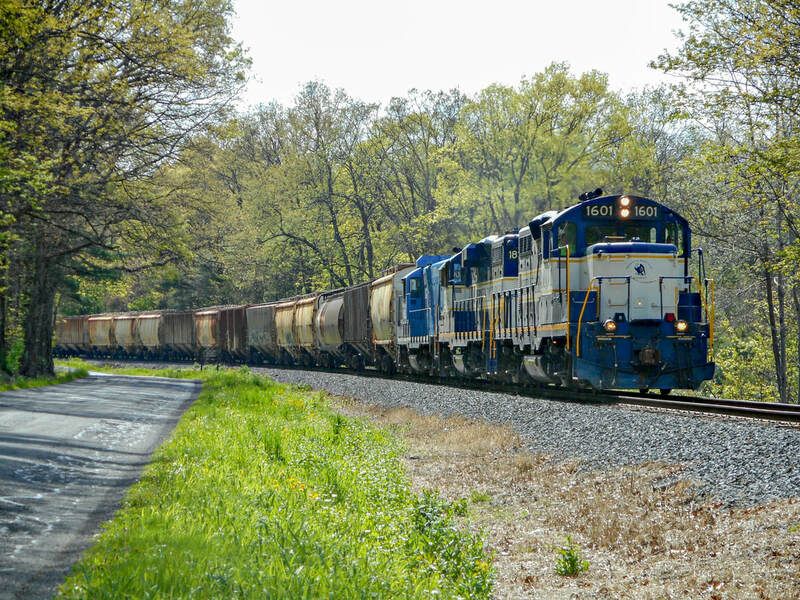 The North Shore Railroad Company & Affiliates comprises six short line railroads, including the Nittany & Bald Eagle Railroad, stationed in Bellefonte, PA, Centre County. NSHR serves central Pennsylvania businesses and industries, running 247.2 miles of track. Commodities handles include aggregates, coal, grain and plastics. For more information about the Nittany & Bald Eagle Railroad, call 814 355-4736. For more information about NSHR rail lines, visit www.nshr.com. Centre County is fortunate to have a number of resources to aid employers with transportation needs. READ MORE.